In this series of posts by the ZNZ Gender Equality Committee, scientists talk about their motivation and inspiration in academic life. Prof. Landau looks back on how Zurich academia has changed over the last decades in terms of gender equality and diversity and to give us advice on what should be changed in the future. Prof. Klara Landau studied Medicine in Zurich, trained and obtained her specialization in ophthalmology in Israel, and, following a clinical and research fellowships at UCSF and UC Berkeley, completed her habilitation at UZH in 1998. She was appointed Director of the Department of Ophthalmology in 2005, a position which she held until her retirement in 2018. 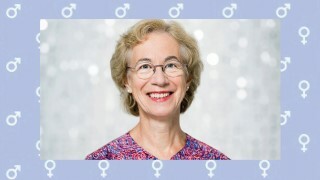 Prof. Landau has served many years in the “Gleichstellungskommission” (of UZH) and the Gender equality committee (of ZNZ) and has been appointed as the responsible for equal opportunity at USZ in August 2018. Why are there still so few women in leading positions at UZH and USZ (or any other Swiss university)? There is no simple answer to this question, as there is no simple measure to change this unsatisfactory situation. The legal ground for gender equality has been established by the past generation, but cultural obstacles in Switzerland seem to persist and are still powerful enough to generally keep women out of the leading positions in academia, especially in medicine. Do you think it is time to substantially change strategies and introduce political, top-down measures (e.g. quota) to promote women careers in leading positions in academia? I am convinced that time has come for more pressure “from above”, which ideally should function through positive incentives, rather than through penalties. The pace in which women increasingly reach the top in academia is much too slow and our society cannot keep losing so much talent in today’s very competitive environment. Were there mentors, colleagues or situations that were especially important to you in the course of distinct career steps? I remember one conversation that I had with a younger woman colleague many years ago, while I was working on my habilitation thesis. I complained about the difficulties in reaching my goal and mentioned that I may give it all up. She was genuinely shocked and encouraged me vividly to continue. For the first time I realized that my career is being observed by younger women colleagues for whom I was a role model. It helped me to keep on going… My mentors were exclusively male and I admired them for their dedication and competence in their respective disciplines. What advice would you give to a talented young female colleague who is unsure if the current situation permits realistic chances for a career in academic medicine? There is no flat answer to this question. I would first of all try to understand the specific circumstances of this woman’s career path and the possibilities awaiting her at her current institution and elsewhere. I would analyze with her all the options and concomitantly try to open possible doors for her by connecting her to key persons who may give a helping hand and enlarge her network. Last but not least, I am convinced that simply encouraging such a smart young and talented woman scientist may be of value, as illustrated in my previous answer.